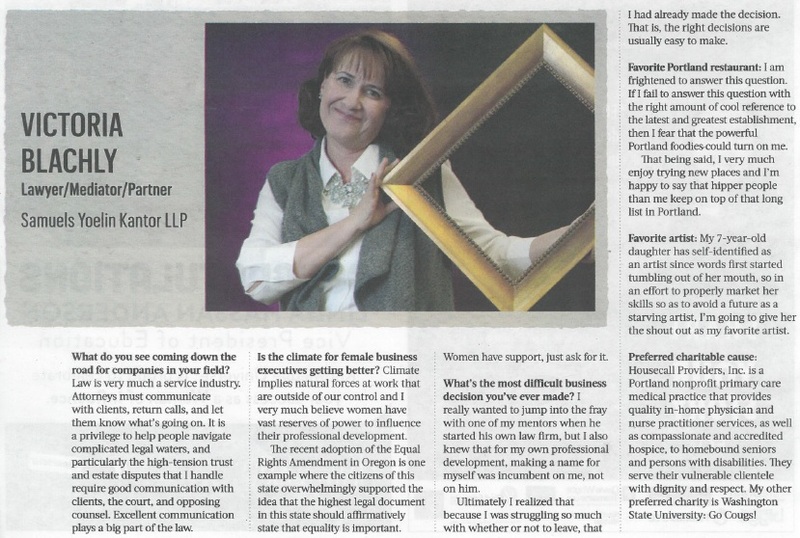 HCP Board member Victoria Blachly was recently named a 2015 Orchid Award Winner by the Portland Business Journal, which honored her during their “Women of Influence” awards ceremony held April 16. Victoria was nominated by Housecall Providers Executive Director Terri Hobbs who was inspired not only by Victoria’s commitment to Portland’s homebound population, but the other important causes she supports as well. Victoria is currently serving her second board term and is the chair our strategic planning committee. The award honors and recognizes the region’s most influential women professionals with strong records of innovation, outstanding performance in their respective fields, and meaningful contributions to their communities. Nominations for the award were judged on three criteria: professional accomplishments, community leadership, and awards and milestones. The following is the Journal’s interview with her.